Hay fever, or allergic rhinitis is an allergic reaction/inflammation of the nasal airways. When an allergen (pollen, dust) is inhaled by an atopic person, then antibody production is triggered, which leads to the release of histamine and other chemicals, which in turn causes swelling, itching or mucus production. In some cases it can also cause skin rashes, incl. hives. - Seasonal: During pollen seasons; mostly develops after the age of 6. - Perennial: Throughout the year; often observed in young children. Neti Pots are an ancient Indian answer not only to hay fever, but a clean nose for any occasion (such as controlled breathing, which is important for yoga). Neti pots rinse away the allergens with saltwater. An Italian study found out that nasal flushing is a mild and indeed effective way of treatment. Stir ¼ to ½ a teaspoon of noniodized table salt into a cup of lukewarm water. The mixture is poured into one nostril and drained out the other nostril. You can experiment with the amount of salt per water. A headache is a pain in the head or the neck, which can be caused by a number of different conditions of the head or the neck. Treatment depends on the cause, but the first step is mostly the removal of the pain itself, typically done by analgesics or painkillers. However, there are other ways to deal with a headache. Vascular headaches. The most common type is migraine, characterized by severe pain on one or both sides of the head, an upset stomach and sometimes disturbed vision. Folk remedy: valerian, butterbur, ginger. Muscular headaches. The most common type is tension headache. It is characterized by tight or tense facial or neck muscles and can radiate to the forehead. Folk remedy: lavender, kanna, ginger, peppermint (applied to the forehead and temples), massage, yoga. Cervicogenic headaches. Usually originates from a neck disorder, brought on by a movement in the neck, or an unusual position of the head. The pain can extend to the shoulders and arms. Hives, or Urticaria is a skin rash, characterized by red, itchy bumps. Hives are often a result of an allergic reaction, however it can also be caused by other things. Acute urticaria lasts less than 6 weeks and is usually caused by an allergy. Chronic urticaria lasts longer than 6 weeks and the cause is, in most cases, unknown. In many of these cases it is due to an autoimmune trigger. In some cases chronic urticaria simply accompanies a viral illnesses, such as a common cold. It can also be brought on by stress, especially posttraumatic stress. Take ¼ cup of brown sugar, 1 tablespoon of fresh ginger and ¾ cup of vinegar and a little bit of water. Boil for several minutes. Apply this mixture externally several times per day. 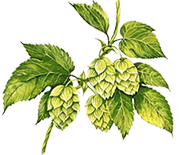 Hops are the female flowers of the Humulus Lupulus (common hop) plant, from the Cannabaceae family. Cannabis and Celtis belong to the same family of plants. Hops are commonly used for beer production, but they are also useful in herbal medicine. Hops help with restlessness, anxiety and insomnia. They can be used alone, or are often combined with valerian. Hops lose their potency after a few months storage. To treat insomnia, sleep on a pillow filled with hops. Harvesting hops can sometimes result in dermatitis (skin inflammation). Hops are toxic to dogs! Get inspired.. because nature rocks!